It’s been an exciting year for human evolution with several discoveries dramatically rewriting major episodes of our ancient past. Some of this progress stems from major advances in fields like ancient genomics, while much has resulted from new fossil and archaeological discoveries made in Africa and China. What’s interested me the most has been the discovery of archaic humans living in northern China until perhaps 70,000 years ago and the oldest anatomically modern humans in the region appearing at least 80,000 years ago. This is because they fall squarely within my own area of research: human evolution over the past few hundred thousand years in East Asia and Australasia. In 2012, we announced the discovery of the ‘Red Deer Cave people’ in Southwest China, a mysterious human group we identified from cranial and jaw bones and teeth from two cave sites located in Southwest China. Today, a team I co-lead with Professor Ji Xueping of the Yunnan Institute of Cultural Relics and Archaeology, and involving colleagues from a range of institutions in China and Australia, announced the discovery of yet another highly unusual bone from the Red Deer Cave people. And it seems to confirm they were a mysterious group of pre-modern humans. The Red Deer Cave (Maludong) during research in 2008. Our previous work showed that the features of their bones and teeth possess a remarkable number of similarities to archaic humans. This is despite them having lived only between about 14,000 and 11,000 years ago from radiocarbon dating of charcoal. Their anatomy was nothing like we’d seen before in modern humans, whether they lived 200,000 or 200 years ago: they were truly unique and a real mystery to us and many of our colleagues. We suggested they could represent either a very early modern human population, perhaps one that settled the region more than 100,000 years ago and became isolated. Or, they could be a late surviving archaic species, akin to a population of Neanderthals surviving in isolation until the end of the Ice Age in Southwest China. Some of our colleagues also proposed at the time that they might be hybrids between modern humans and an unknown archaic species as an explanation for their peculiar traits. We had focused our work on the skulls and teeth, representing four or five individuals, thinking they would offer the best insights into just who these mysterious people might be. But, alas, we were left with considerable uncertainty. There was no clear answer about which species they might belong to or whether they could be hybrids. So back to work we went. 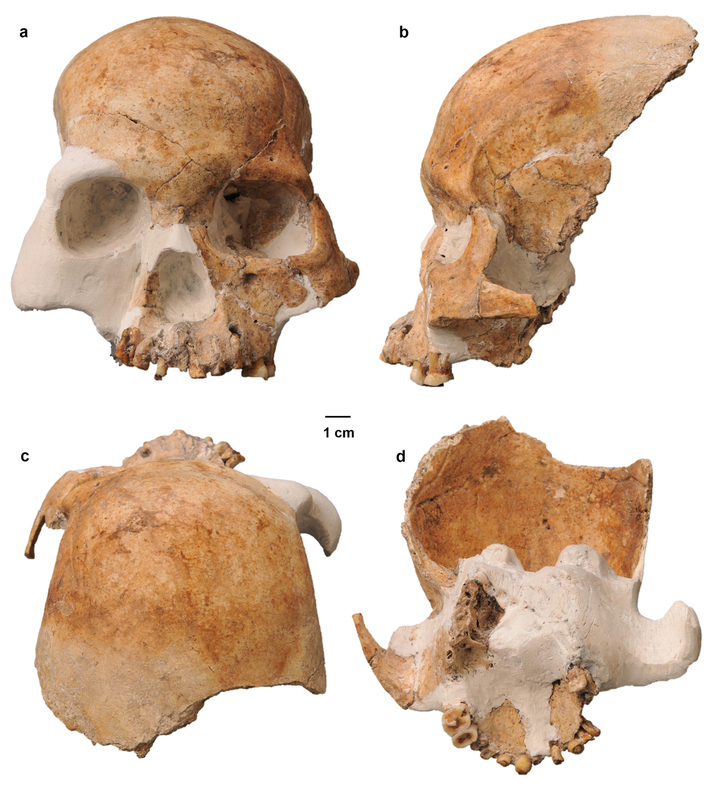 A couple of months ago we published a new study of the Longlin or Laomaocao Cave specimen, which we had also placed in the Red Deer Cave people in 2012. We’re now treating it as part of a separate group, distinct from the bones from Red Deer Cave, or Maludong, and one that we now think is indeed very likely to be a hybrid. And direct dating on human bone now confirms that the specimen is only 10,500 years old. If we’re correct, then either there were archaic humans still around at that time in Southwest China who interbred with modern humans, or their hybrid features persisted longer after interbreeding occurred because of isolation and perhaps through the action of natural selection or genetic drift. Our study published this week outlines detailed work on a thigh bone or femur from Maludong, located only 6km Southwest of the city of Mengzi, near the Northern Vietnam border. Like the skull bones from the site, it is also dated to about 14,000 years old. But unlike them, it provides a much clearer indication of what at least some of the Red Deer Cave people bones might be. Our work shows that the thigh bone strongly resembles very ancient species like early Homo erectus or Homo habilis, which lived around 1.5 million years ago or more in Africa. Red Deer Cave people thigh bone compared with a modern human (not to scale). Like these pre-modern humans, the Maludong femur is very small. The shaft is narrow, with the outer layer of the shaft (or cortex) very thin, the walls of the shaft are reinforced (or buttressed) in areas of high strain, the femur neck is long, and the place of muscle attachment for the primary flexor muscle of the hip (the lesser trochanter) is very large and faces strongly backwards. Surprisingly, we reconstructed its body mass to be about 50 kilograms, making the the individual very small by pre-modern and Ice Age human hunter-gatherer standards. We need to be a bit careful though, as it is only one bone. Still, when seen in the context of the archaic looking skull bones and teeth from Maludong, our results are very compelling. How is it that such an ancient looking species could have survived until so recently in Southwest China? Well, the environment and climate of Southwest China is unique owing to the tectonic uplift of the Qinghai-Tibetan Plateau. Yunnan Province today has the greatest biodiversity of plants and animals in the whole of China. It is one of 20 floristic endemic centres as a result of its complex landscape of high mountains, deep valleys, rift lakes and large rivers. The region around Maludong is also biogeographically on the northern edge of tropical Southeast Asia and many species found there today are very ancient indeed. The area is a biological refugium owing to its variable topography and tropical location. The Maludong femur might therefore represent a relic, tropically adapted, archaic population that survived relatively late in this biogeographically complex, highly diverse and largely isolated region. Now, we can’t deny that our work is controversial, with some our colleagues simply unable to accept the possibility that archaic looking bones could be so young, especially in East Asia. Yet, when Homo floresiensis was found a decade ago the same kinds of comments were made. This species looks a lot like Australopithecus skeletons, like Lucy), that lived in Africa 3 or 4 million years ago. While not everyone has accepted the so-called “Hobbit” from Flores as a valid new species, most anthropologists and archaeologists have. At a conference in Shanghai this week, which I attended, scientists from the Russian Academy of Science in Siberia presented evidence about the cave of Denisova in southern Siberia. Coincidentally, a new article by the same team on Denisovan DNA also come out this week in the Proceedings of the National Academy of Sciences of the USA. It was a big surprise to me to learn that they have found rather similar kinds of things at Denisova Cave, except that the bones are 30,000-40,000 years older than at Maludong. They’ve recovered evidence for multiple archaic species like the Neanderthals and Denisovans in the same cave layers as modern human dating to about 50,000 year ago. And in a slightly older unit in the cave they have found Neanderthal, Denisovan and possible Homo erectus bones, again together from a single layer. Within this context, and the Hobbit from Indonesia, our finds don’t look so out of place after all. 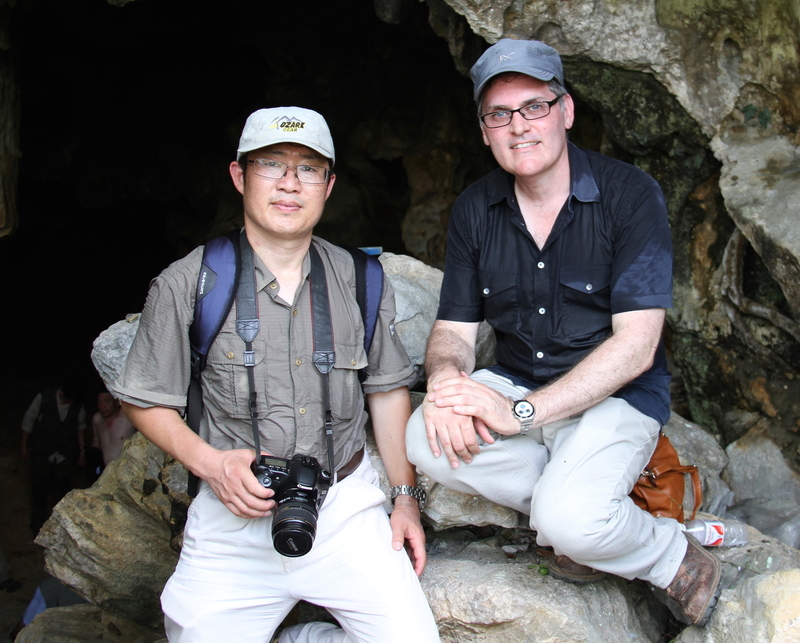 The author and colleague Ji Xueping at a Palaeolithic cave in southern China. We need to also keep in mind that most of what we know about human evolution is based on the fossil records of Europe and some parts of Africa, like the East African Rift Valley, and caves in South Africa. We’re quickly learning that Europe and Africa may not provide the best model for us to use to interpret the fossil record of East Asia. For example, Denisova Cave is as far east as we’ve found the Neanderthals, and they don’t seem to have occupied Siberia permanently. This is unlike Europe, where they lived until about 40,000 years ago. And so far, no Neanderthals have been found in China or anywhere further South of Denisova Cave. The fact is that we’ve really only scratched the surface in East Asia. We still have an enormous amount to learn about which species were living there when the first modern humans arrived, and about how they interacted with the Palaeolithic ancestors of living East Asians. Despite the progress we’re making about these and other ancient humans in Southwest China, we’re left with many riddles still about the Red Deer Cave people. Just who exactly were these mysterious Stone Age people? Why did they survive so late? Why are they found only in tropical Southwest China? What did modern humans make of them? And how did they interact with them when they encountered them? Did they interbreed with them? We hope to be able to answer more of these questions soon.